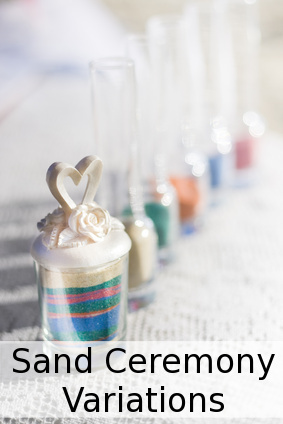 A wedding sand ceremony is a meaningful and trendy alternative to a unity candle ceremony and it is becoming so popular. It is a great alternative to the traditional unity candle ceremony. Why would you want to change on tradition, you may ask? 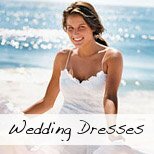 Well, maybe you just want something different, or, you are having a beach wedding and this would be more appropriate, not to mention more practical (just think about trying to keep candles lit in a beach breeze...) than a traditional unity candle. Well, in short, nobody really knows about the origins of the sand ceremony. Some people believe it is a part of Native American wedding rituals and others argue that it originates from Hawaii. Wedding couples would take sand from under their feet at a certain time during a Hawaiian wedding ceremony and pour it into a single container as a symbol of their joined future. Regardless of where it comes from, this is a beautiful and meaningful addition to your beach wedding ceremony or a very suitable alternative to a unity candle ceremony. Choose your containers. 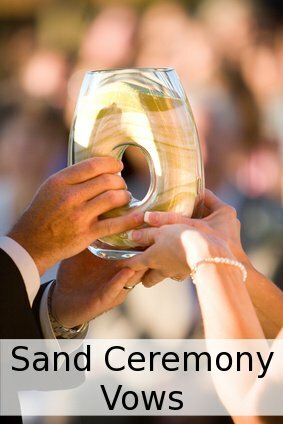 You need one keepsake container or vase into which you will pour the sand as well as containers for all participants to the ceremony (bride, groom and any children if you choose). Shells make great ones! You can also have the keepsake container engraved with your wedding date etc. Pick the sand you want to use. You can choose a different color for each person, going neutral or using your wedding colors. Find some colored sand here. You can also choose to use ready made wedding sand ceremony kits. Decide on the wording and vows you want to use during the ceremony as well as which version you would like to use. On the day of the wedding have your main vase on a small table near the altar or under the wedding gazebo/canopy. Surround this with the smaller vases filled with sand for each person participating. You can decorate this with flowers or candles (wind permitting). At your chosen time during your ceremony, the bride and groom (and all other participants, if any) will approach the table where the vases/containers are and will fill the main container of sand from each of their individual containers. It looks lovely if you move around to make beautiful layers. 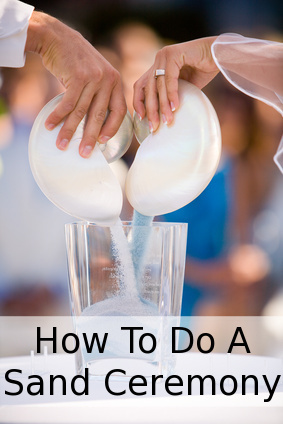 While you do this your officiant or a friend would read your chosen sand ceremony vows. After you have finished the ceremony, fill the vase with the rest of the sand, leaving about half and inch or 2cm from the top of the vase. Transport carefully home. In a microwave oven or on the stove, slowly melt some candle wax and carefully pour it over the top of the sand to seal it closed. You can either coordinate the color of the wax, or if you wish to hide it, tie a ribbon around the top and finish with a nice bow.